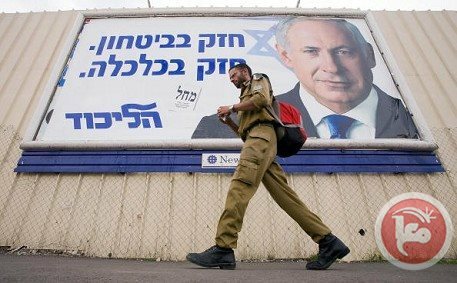 The victory of Benjamin Netanyahu and his right-wing allies last week at the polls amounts to a major defeat of left and center-left parties in Israel and is merely one more indication that Israeli society is continuing a strong trend of radicalization. Over the last 20 years, with only some fluctuations, each successive Israeli government and parliament has been more radical and more right-wing than the one before it. The only way to explain this drift in the direction of increasingly rigid and extreme political positions is the absence of accountability. Israelis have been allowed to have their cake and eat it, too. They have been allowed to continue disregarding the expectations of their backers, particularly the US and Europe, and to continue expanding settlements while ignoring their friends’ chiding remarks. Part of the reason for this is that in the current regional security chaos, Israel is seen as increasingly valuable to Western powers. Palestinians, meanwhile, have made a mess of their own affairs, allowing an internal political chasm to grow and thus deterring and confusing the nation’s friends in their attempts to offer support. The lack of pressure on Israel means that Israelis do not have to pay any price for their violations of Palestinian rights. Every sign is that these negative trends will continue — leading all involved away from a rational and principled solution to the Palestinian conflict and into an abyss of force and violence. It is easy to predict Netanyahu’s way forward in dealing with Israeli-Palestinian relations and the future of the peace process. His previous governments were systematic in expanding illegal settlements, consolidating the illegal Israeli occupation, blocking peace negotiations — Israel was openly blamed for the failure of the last round of talks lead by US Secretary of State John Kerry — and continuing to undermine the Palestinian Authority and its leadership. Netanyahu’s ability to continue on this path is wide open. Israel’s successive right-wing governments have created a status quo that is quite comfortable for Israel while being brutal for Palestinians. This status quo was created partially through negotiations and the fact their outcome has been frozen in time, and partially through the use of unilateral force. Israel gained security and its occupation is less costly than ever. At the same time, Palestinian needs were not met and public frustration has been rising. The Palestinian leadership last year expressed its inability to live with this status quo by crossing Israeli “red lines” and joining the International Court of Justice, trying to gain back some leverage by inviting outside intervention. But to punish the Palestinian leadership, some Israeli politicians stated in their election campaigning that the Palestinian Authority could be “downgraded” or done away with all together. This might have been election fever — but it also could have been very serious. It is quite possible, if Netanyahu and his cohorts are given a free hand for four more years, that this will be enough to close the historic opportunity for a two-state solution. The current moderate Palestinian leadership will be the second casualty of such international negligence. Indeed, in the aftermath of the Israeli election results, Palestinians find themselves with only one option to slow this process, which is to challenge the Israeli government where it is weakest, namely to fight Israel in international arenas and on the basis of international law. This could include joining more international agencies, going back to the Security Council, filing war crimes charges against Israel and Israelis, and doing more to encourage friends to adopt boycott, divestment, and sanctions against an unchecked Israel. It is the Palestinians’ right to pursue all legal and legitimate means of achieving their aspirations and ensuring their own protection. We must be candid about the future. This approach will not move the parties towards peaceful agreements, but rather will bring about more Israeli recriminations and pressure on Palestinians. Tensions will rise. The only other countervailing factor is the involvement of the international community. Unless the US and Europe introduce elements of accountability into their relationships with Israel, the coming four years are likely to be dramatic, and will include the final closing of the chapter started in Oslo over two decades ago. Ghassan Khatib is Vice President for Development and Communications and a lecturer of Cultural Studies and Contemporary Arab Studies at Birzeit University in Palestine.